This page contains all the pieces specifically for building and flying the 32" EPP Yak55. Showing all sides of the paint job on our painted kits. This is the typical version of the plane flown. It has the light weight and great handling characteristics and yet the EPP foam gives it some resilience to the bumps and less than perfect landings seen when learning new maneuvers. It is fully capable of 3D maneuvers and can be flown indoors or outdoors and yet can be toned down to be grown with and into. 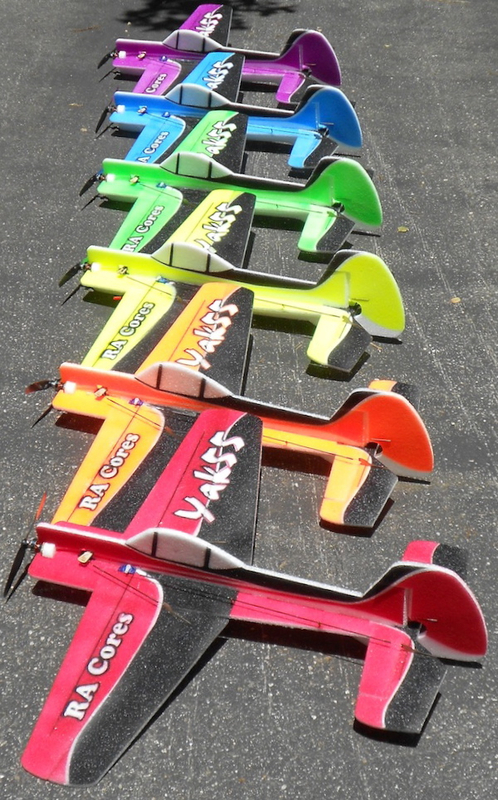 This is not a self-righting trainer airplane but it is a great option for learning more advanced tricks and a fun companion indoors over the winter that will move outdoors with you in spring. The 9mm EPP Yak55 YouTube video playlist. There is a review of this kit on RCGroups here. Select prop based on 2S or 3S battery.